1. Heat a skillet over a high heat. Brush the asparagus with 1 tablespoon extra virgin olive oil, add a pinch of salt and cook in the pan, along with the tomatoes for about 10 minutes. Turn occasionally until they are slightly charred. Remove from the heat and keep warm. 2. Heat the slices of bread, rub one side of each slice with the garlic and transfer them on to a platter. 3. 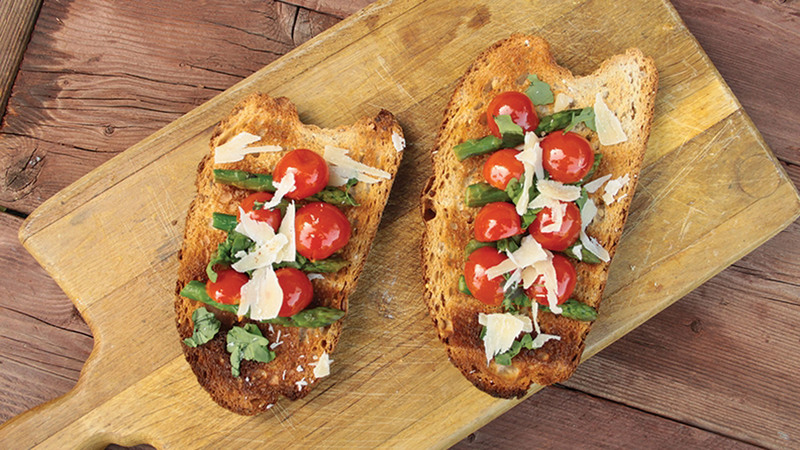 Arrange the asparagus and cherry tomatoes on the bread. Drizzle with the remaining olive oil and, if desired, a sprinkling of Parmigiano. Recipe from The Vegetarian Italian Kitchen by Veronica Lavenia, available from New Holland Publishers.